There was absolutely no way we couldn’t have shared today’s bridal shoot with you – it’s so damn pretty! So, the next thing you are probably going to ask yourself is ‘how can I get this look for myself?’. Well, don’t worry as wedding planners, Laura and Kym are sharing the how’s and why’s of throwing a bridal shower so you can get the look for yourself. “Not every bride or groom has a clear vision of what they want their wedding to look like – some might even feel pressured into conforming to certain traditions such as the classic, floor length gown, a simple but elegant bouquet and a local church wedding with all family and friends involved.” Began wedding planners, Laura & Kym. “While this might be the ideal wedding for some, bridal shoots help to ignite that little creative spark, embracing the unique and original. After all, it is your wedding day! 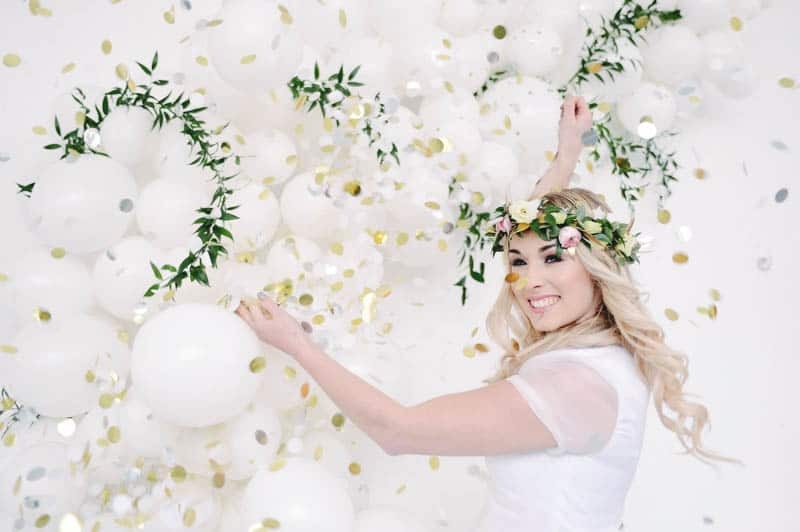 That’s why with every inspirational shoot we create, we like to do it a little differently and for our bridal shoot we we wanted to go completely out there!” They continued. “The florals for the shoot were a mixture of pastels, sprigs of eucalyptus, lush greenery and gorgeous gold accents. The flower hoop created by Elodie from Flourish & Bloom was one of our favourite little quirks for this shoot – a fab alternative to a bridesmaid bouquet. Topping this all off with a unicorn cake, some Prosecco and a chilled-out warehouse environment, we were good to go!” They added.